We have been producing landfill alarm systems since 1958; all our systems are designed for use on both manned and unmanned sites. Our M30 alarm system is an industrial machine that has been designed with our customers input over the last 50 years. It comes with all the features you would expect including 4 to 56 separ ate inputs, battery backup, voice and SMS alarm messages and lighting / surge protection – check out more features below. 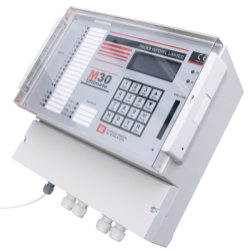 The M30 is in use around the world for monitoring landfills by such companies as Viridor, Summerlease and various councils plus local authorities for protecting their active and closed Landfill sites. Typically they monitor such things as flare stack alarms, Gas alarms, engine failures, mains failures, lone worker alarms, water levels and tank levels etc but the list is endless. Each M30 comes with a PSTN landline connection; this can be used as your primary connection or ignored if you prefer to connect to the GSM networks to send voice and SMS alarm messages. The GSM feature for voice on the M30 can be used in 2 ways, either as a dedicated connection for situations where you don’t have a landline PSTN connection, don’t want one or as a backup. When used as a backup the M30 monitors the connected PSTN line, if it fails or is cut the M30 will automatically switch to the GSM network to ensure you will always get the alarm message. 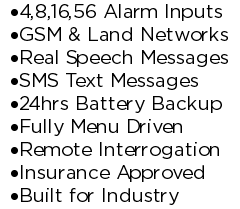 The M30 can send SMS as well as voice alarm calls over the GSM or PSTN networks. It is very easy to setup, when programming you just select whether the alarm recipient will get a SMS or voice call. Each input \ channel has its own dedicated customisable message so instead of a generic “Channel 1 alarm” you get a more useful “Flare Stack Bean Field Alarm” message. As the M30 is designed an built by us in the UK it is fully customisable, so if there is a special feature you would like or you would like it to work is particular way please let us know and we will normally be able to create it for you. Auto Isolate – M30 automatically turns on and off at predefined times and days. Channel to Roster – each input can dial a totally separate list of alarm contacts. Auto Test – The M30 will automatically make a test call at a predefined time and day. As an advanced industrial unit made in the UK, the M30 comes with all the types of features you would expect, including free UK based phone support and on the road engineers for servicing, installation and upgrades. For more information on our Landfill Alarm Systems, help or pricing please contact us or visit our standard features or auto dialler FAQs pages.